As the 1970s wore on, and NBC remained deep in third place on Saturday mornings, the network threw a bizarre Hail Mary and sort of poached The Krofft Supershow from ABC. I’ve always wondered about this, and why the Kroffts switched networks, changed up the format, and crashed and burned so badly. For two seasons, their umbrella program had been hosted by Kaptain Kool and the Kongs. Now it was a more traditional variety program, hosted by the Bay City Rollers, and was a huge failure. The Krofft Superstar Hour only aired for eight weeks. Coughing up blood in the ratings, the network pulled the show and edited the remaining five installments down to a half-hour program called The Bay City Rollers Show. Even those bombed and the show was off their schedule by Christmas. Even stranger, there was absolutely no merchandising for the two new programs within it: Horror Hotel and Lost Island. Not a View-Master, not a coloring book, not a lunch box. The two shows didn’t even have opening credits with the fun theme tunes that all their previous series had. When most of the Kroffts’ programs were repackaged for syndication, these were not included. When four or five episodes from most of their programs were released on VHS in the mid-eighties, these weren’t among them. Columbia House ignored them, and so did the celebrated repeats in the mid-90s on the Family Channel. Exactly one installment of Horror Hotel has been released on DVD. It’s included as a bonus feature on this 2011 collection of H.R. Pufnstuf. Even today, with IMDB, Wikipedia, and that Live Action ’70s Kid Vid page that still has frames (it’s cool, we all get busy), the Superstar Hour is still determinedly obscure, in part because there are almost no decent, high-resolution images available. Thanks to the Bay City Rollers’ active fanbase, nth-generation washed-out bootlegs of some of the episodes have survived on VHS, allowing us to catch glimpses on YouTube. The show was directed by Jack Regas, and written by Mark Evanier, Lorne Frohman, and Rowby Goren. Only eight of the Lost Island segments ever aired before the show was retooled. The remaining five were never broadcast. Horror Hotel reimagines Witchiepoo as the owner of a crummy hotel, with Orville, Seymour, Stupid Bat, and Dr. Blinky as her staff. Hoo Doo, the villain from Lidsville who is played by Paul Gale here, is a cantankerous permanent resident. Guest characters are usually played by Jay Robinson, Louise DuArt, and Mickey McMeel. Lost Island is even more bizarre, but I’ll cover that separately in a footnote / comment. And there’s one more weird oddity from this production. You remember that in the seventies and early eighties, the networks would have Friday night preview shows for their new Saturday morning lineups? NBC’s 1978 showcase is effectively a bonus episode of this series, entitled The Bay City Rollers Meet the Saturday Superstars. It brought along Erik Estrada from CHiPs and Joe Namath from The Waverly Wonders as guests. Namath also appeared in an additional episode of Horror Hotel, which, although it was probably taped last, was shown as the very first episode. The bootleg of this special that’s been floating around YouTube for a few years is missing the first half of the Horror Hotel spot, among other things; evidently the original taper of this copy was not interested in the parts that didn’t have the Rollers in it. The complete version is, I can attest, pretty darn funny. It’s on one of about twenty-five VHS tapes I still own. Sadly, I have not had a VCR in years. Counting the Namath episode as the first of fourteen, then, assuming that the date on the YouTube bootleg of this full episode of The Bay City Rollers Show is correct (Nov. 18 1978), this episode of Hotel should be the twelfth broadcast. Like many of the others, Robinson and DuArt appear as one-off characters. Horror Hotel was never going to win any awards, but the whole show is, thanks to Billie Hayes’ amazing energy, just bizarrely dynamic for a sitcom with only one principal set, and I really regret missing it as a child, because its dopey, kid-friendly shenanigans are packed with the kind of lovably dumb jokes that elementary school-aged kids absolutely adore. Cut loose from the power struggle and danger of H.R. 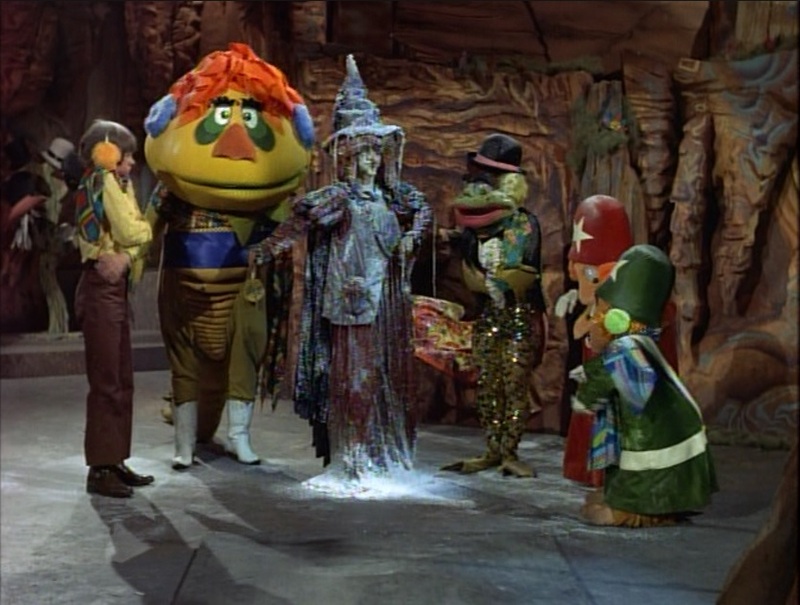 Pufnstuf, Witchiepoo actually made a very funny good guy in this, trying to run a hotel and simultaneously be a star, with four incompetent monsters on the staff and her one grouchy, demanding permanent guest. Watch this nonsense with a kid of knock-knock joke age, and that kid will clutch his sides from laughing so hard. Our son adored this. He giggled and laughed all through the thing, interjecting “Horror Hotel? They should have called this Silly Hotel!” as the characters went through one of those corridor scenes so beloved of seventies Saturday mornings. (He’s seen it a time or two on The Ghost Busters, of course.) Sure, it’s dopey, but for a show pitched at five year-olds, it’s a downright triumph, and I really hope that a few more episodes emerge from the Kroffts’ vault before we all get too old. Very soon after the production of the TV series finished – very soon indeed, as the opening sequence really looks like it must have been filmed in the fall – the Kroffts took a million dollars of Universal’s money and made a terrific feature film version of the show. The budget for the feature was the same as for the seventeen episodes. Some of the costumes are reused, in whole or part, but many, including Pop Lolly, Dr. Blinky, and Pufnstuf himself, who has a new head with a much softer mouth, are different. Some of the voices are also new. Lennie Weinrib, who had originally voiced Pufnstuf and Orson, among others, was busy doing other projects. Allan Melvin and Don Messick split the work of all of Weinrib’s characters. The larger budget meant that Hollingsworth Morse could also shoot on much larger sets at Universal than he had at Paramount. Three of the main places on Living Island – the Clock House, the Candy Factory, and Dr. Blinky’s house – are all now seen to be in one village instead of on separate sets where it was suggested that they were in different places. And Witchiepoo’s castle gets a fabulous makeover, with more stairs to climb and places for people to interact. It looks lovely. 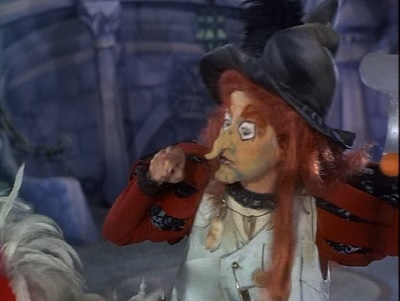 Oh, and Morse and his cinematographer, Kenneth Peach, pulled off a completely astonishing done-in-one-shot version of Witchiepoo being so ugly that she breaks the mirror in her hand, requiring Billie Hayes to hit a precise mark with the mirror held perfectly for her reflection to be captured. $1,000,000 in 1969-70 money is equivalent to $6,228,435 today, and you don’t hear of movies only costing that little anymore. This wasn’t a film meant to dominate the box office; it was meant to make its money back and then play summer film fests for kids for years to come, which it did. It was the sort of movie that spent every July in the 1970s being screened along with a few Disney live-action pictures and the Pippi Longstocking films in libraries in front of kids on the carpet while moms took a break. Unlike many movie versions of TV series, this isn’t a “bonus episode” of the narrative. It’s an alternate take on things, reusing plot elements from several of the original stories. It means we get to see Jimmy meet Freddie after the flute comes alive, and get abducted by the witch’s boat, and meet all the people on Living Island again for the first time. In the short time between making the show and the movies, Jack Wild’s acting improved tenfold. He really sells the wide-eyed disbelief of what he’s seeing. So how’d it go over at home? Well, at 95 minutes, it’s right at the limits of how long our son can be expected to sit kind of still, but the bleakness of the story, and one visual, really got to him, I fear. There’s an urgency to the plot that the series really doesn’t have. 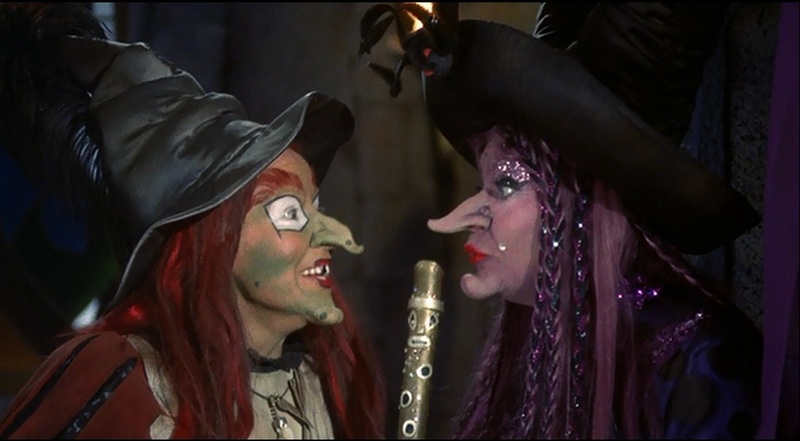 Witchiepoo makes the mistake of boasting to her rival, Witch Hazel, about the golden flute with the diamond skin condition, and Hazel gossips to everybody about it. Word gets to Boss Witch that Witchiepoo’s got something especially amazing, and so when she loses it to those goody-two-shoes in their rescue, she has to get it back at all costs. Boss Witch has phoned and told Witchiepoo that the annual witches’ convention is being held on Living Island. At the convention, Mama Cass completely steals the movie with a musical performance. It’s written, as all the music in the movie, by Charles Fox and Norman Gimbel, who’d later write “Killing Me Softly With His Song.” It’s called “Different,” and even with a cucumber on her nose and a plastic rat in her hair, Mama Cass is amazing. I love this song so much. Daniel was a little restless during all the music, sad to say, but Witchiepoo really horrified him with her rottenness this time out. Capturing all the good guys – except Jimmy and Freddie, who’ve run away, ironically, hoping to stop endangering their friends – by shrinking them and sweeping them into her hat was awful enough, but then she plans to feed her guests by cooking Pufnstuf! The sight of poor Puf strapped to a rotisserie with a huge apple in his mouth caused some tears, and we had to hug and reassure him that even though this was a movie and a little different from the show, Witchiepoo was still going to lose. I thought that if anything was going to get under Daniel’s skin, it would be Boss Witch and Heinrich. Now, she’s played by the great Martha Raye and we’d see her, and the Heinrich costume, again in the Kroffts’ next show. This series, The Bugaloos, would feature music by Charles Fox and several stories written by this movie’s screenwriters, John Fenton Murray and Si Rose, so this film really is the link between the two TV programs. Heinrich actually unnerves me ever so slightly. Unlike Witchiepoo’s bumbling gang, Heinrich is played straight, and he’s a no-joke Nazi rat, who snaps to attention and barks commands in German. And then there’s Boss Witch, and she’s trouble. I interviewed Sid Krofft about twenty-five years ago and one of the proudest moments of his career, he said, was reviving Martha Raye’s. She had been a huge star in the 1930s and 1940s, but roles had been tapering off, as they often did, and sadly still do, for women over the age of forty. In Raye’s case, however, she had been very slowly brushed to the side by people who didn’t agree with her politics. Raye was a firm supporter of the USO and made many tours to Vietnam to entertain the troops. Krofft told me that she’d been “blacklisted,” and this was the first real role that she’d had in years. 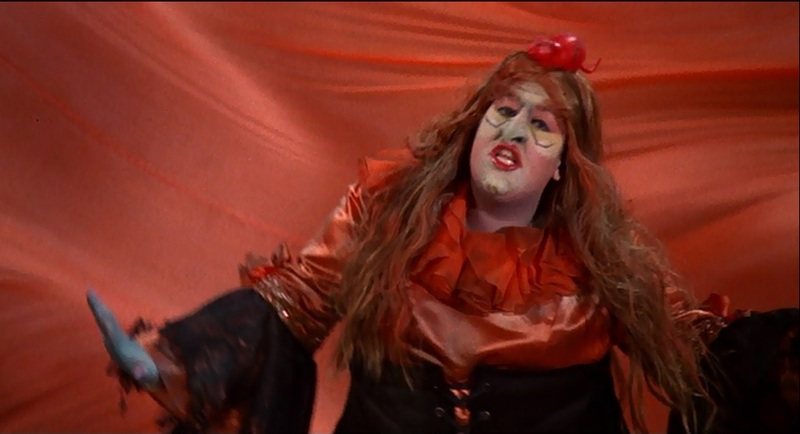 She’s not funny-evil like a usual Krofft villain, and like she’d be in The Bugaloos, and so, teamed with the harsh Heinrich, she strikes an unusually discordant note in the movie, but it still works wildly well. When she does get a funny line – Witch Hazel protests that the Witch of the Year award is a fix and Boss Witch says that of course it is, because witches don’t play fair – it brings down the house. One final reminder that we’re not on Saturday mornings anymore, by the way, comes from the devilish jokes in the script. NBC would have never passed lines about Lucifer or Satan, or Witch Hazel’s final insult of “Go to Heaven!” They certainly wouldn’t have approved Witch Way, who is drunk throughout the convention. And in a G-rated movie, too! Apart from weeping over Pufnstuf being roasted on a spit, Daniel enjoyed the movie and laughed and cheered. There’s plenty for grownups to love and, for kids, there’s lots of slapstick action and Stupid Bat crashing into walls repeatedly and fire extinguishers in the face and one last comeuppance for the meanest and most rotten witch of them all. Wait, did I say last? You know I didn’t mean that, right? This episode is amazing, but it sure went over Daniel’s head for a minute. Okay, so Witchiepoo gets notice – via a tickertape announcement in her image machine – that Boss Witch is coming for an inspection. Nobody has met the Boss Witch or knows what she looks like, which turns into an obvious, but hilarious plot point. Billie Hayes is in fine form this week, because she’s in a complete panic, absolutely convinced that Boss Witch will hate her. What Witchiepoo doesn’t know is that Boss Witch cancels her inspection, and she doesn’t know that because Stupid Bat, carrying a “bat-o-gram,” crashes in the forest and loses the note to the good guys. Witchiepoo decides that Pufnstuf will make a nice gift for the queen of magic and empress of evil, and so, to rescue him, the good guys dress Jimmy as what they imagine Boss Witch might look like, so he can go into the castle, be groveled at, whack Witchiepoo in the head a time or three, and generally command the place. Then Jimmy adds insult to injury by threatening to banish the ineffective witch from Living Island. 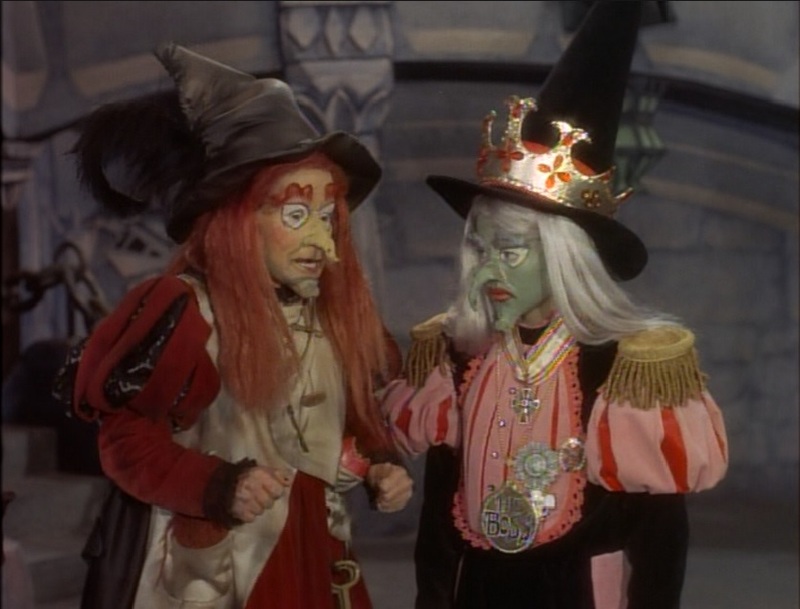 It’s absolutely one of the high points of the show: Jimmy-as-Boss Witch interrogates Pufnstuf about how rotten Witchiepoo is, and Puf throws her under the bus, bragging how she’s such a sweetheart and even once brought some nice cookies to his cave. But we had to pause and go back, because Jack Wild’s makeup job was so hilariously good that it completely convinced Daniel. I couldn’t understand why he wasn’t reveling in seeing the witch get such a long and deserved comeuppance until I realized that he didn’t know that was Wild. He saw this strange newcomer as somebody who was much more frightening than Witchiepoo and reacted with a bit lip, accordingly. He enjoyed it a lot more the second time around! Which makes me wonder… we actually will be meeting the genuine Boss Witch in a few weeks. I wonder what he’ll think of the real deal? I was mistaken in thinking that Judy Frog only had a real role in the first episode. She’s one of the major players in this one, which sees her teaching everybody a dance called the moon walk. Only thirteen years before the release of Thriller, too! This one kind of feels like everybody’s running out of ideas, honestly. It’s silly like it should be, but it’s just a very standard runaround involving a Trojan Horse birthday cake. The flute gets captured and they go get it back. Cling and Clang get a lot to do in this one, and Stupid Bat has some more screen time, but it’s pretty skippable. We began the Fire-Breathing Dimetrodon Time experience with the first of four series that I thought the least likely to cause undue panic, but Wilhelmina P. Witchiepoo caused exactly that. We did warn Daniel that this show has a witch in it, but that she’s “a kooky old witch,” and really not very good at being bad. Unfortunately, he went straight from “there’s a witch on screen” to “hiding behind the couch.” It turned out all right in the end. He said that he really liked the show and wants to see more, and for that, we can probably thank Witchiepoo’s underlings for being so wonderfully incompetent. He liked the scene where Orson and Seymour crash into each other and knock themselves out, and he liked Cling and Clang, their slide, and the Rescue Racer. This episode introduces Stupid Bat, who’s my favorite character, and the Evil Trees, one of whom has a wonderful line, “I think that I shall never see / A tree as terrifying as me!” Daniel didn’t like these as much as I did. The first unflattering cultural stereotype in a Krofft show comes at five minutes into the episode, when we meet a Native American – “Indian” – tree called “Redwood,” and who calls Jimmy “Paleface.” At the end, we meet the four winds, and sadly the East Wind talks in a vaudeville Charlie Chan voice. I’ll talk a little more about the absolutely bonkers set design and puppetry in future installments, but it’s worth noting that “The Magic Path” introduces Judy Frog, a character mostly abandoned to crowd scenes after this appearance. Judy Frog is an homage to Judy Garland, which makes sense as H.R. 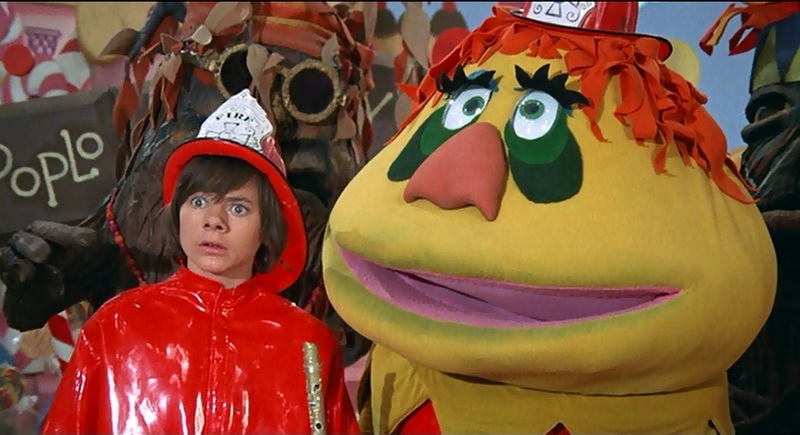 Pufnstuf owes so much to the film version of The Wizard of Oz. The Kroffts’ puppet show had been an opening act for Judy Garland’s live shows in the late 1950s and early 1960s. Garland passed away in June 1969, aged 47. I’m not certain when in 1969 these episodes were actually filmed, but I suspect that they made this episode before her death. It was first shown on NBC on Sept. 6 1969.